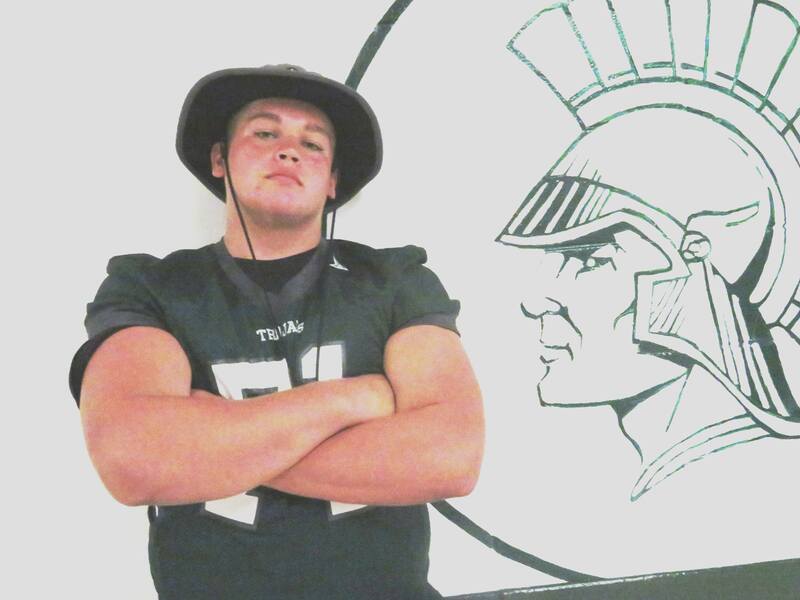 Wauwatosa West's junior lineman Austin Ertl is a young man who is very confident about his ability and his goals. Not surprising since the 6-feet, 2 inch, 297 pounder is a two-time All-Conference player with all the tools. But Trojans' coach Matt Good sees room for improvement and Ertl agrees with his assessment. "He needs to have a nastier streak - especially on the offensive line - where he just needs to rip your heart out," Good said. "I think he has that on defense, but offensively sometimes he catches blocks instead of being the guy who finishes blocks. We'd like to get him there." Austin smiles when asked about his offensive line play. "Sometimes I have a tendency on offense - I'll get someone down and then I will turn around and look for the ball," he said. "So I want to work on staying on my blocks longer and look for a new guy to block instead of just turning around and watching the ball." If Ertl improves his aggressiveness, there is no telling what kind of career he will have, considering his first two seasons at Tosa West. He earned all-conference first-team honors on the offensive line as a freshman. Then as a sophomore last fall, he was named first-team all-conference lineman on offense AND defense. Ertl is a versatile athlete off the football field as well. After playing basketball since he was a youngster, he switched to wrestling this winter and excelled for the co-op Tosa team. In the spring he took part in the shot and discus and just missed qualifying for state in the former. Austin recently recalled his first season. "My freshman year I wasn't really accepted by all the upper classmen," he said. "But after the first game, everyone told me you're part of the team now. We know you can play. "Making all-conference as freshman gave me more confidence than I really thought I had. I set my goals high to get a scholarship when I made all-conference my freshman year. Now knowing I made all-conference two years in a row, it showed me I can play at the next level." Austin has two Division 1 offers already, from the University at Buffalo and South Dakota State University. Photo by Tom "Sky" Skibosh --- Tosa West's Austin Ertl earned all-conference honors on offense and defense as a sophomore after making it on offense as a freshman. Austin started playing football in third grade for the Red Knights before playing for the Jr. Trojans. "In fourth grade I played up for the fifth grade Jr. Trojans team," he said. "My dad was my coach from fourth grade all the way through eighth grade. He used to be a head coach up north in Tomah. "My dad played in college and I always wanted to follow what he did. And that's why I always wore No. 71, because he did in college." Austin's dad, Phil, is the current Superintendent of the Wauwatosa School District. His mom is Kirsten and his brother, Logan, is a freshman and plays football at West. Good first remembered when he laid eyes on Austin. "He was a fifth grader on Jr. Trojans," he said. "He was always bigger than everyone else and he would run through people. I used to hear stories about Joe Thomas (former Brookfield Central tackle and current Cleveland Browns All-Pro tackle) and there are some similarities between them as Austin has come through the program." Good knew he would get good things from Austin right away. "As a freshman, coming in, his work ethic was outstanding. Right away you could see he had just a little different way in the weight room, his attitude in the weight room," Good said. "The way you were able to coach him and the things you were able to do with him compared to most kids and the way you could push him. "He was a sponge. He always wanted more. He was watching linemen videos. He was watching strength videos, tackle videos. He was like a sponge and those are the special ones. They want to learn." When asked about Ertl's strong points, Good had a similar answer. "His passion to get better. He has an unbelievable work ethic that wants to be great," he said. "He wants to be great, he works so hard every day in practice. He works so hard outside of football to get better at moves. He works so hard at footwork. He does extra footwork drills. He does extra strength drills. "If he needs to get better at something, he goes and practices it. He does those things that make him an unbelievable talent to go to." Good then focused on Austin's talents on the gridiron. "His agility and quickness for a big guy; he's got incredible feet," he said. "He used to be a basketball player, then recently he switched to wrestling and I think that move helped his career in terms of being a competitor, his balance, all the things that go along with those sports have aided him in the right way." Photo by Tom "Sky" Skibosh --- Coach Matt Wood moved Austin Ertl to center this season because his skills fit well into this offensive scheme. Austin has moved from tackle, to guard to center to help his team according to Good, who raved about his move to center. "That move solidified our offensive line. It made our offense go. A kid that big and that good playing there. As a tackle as a sophomore he made all-conference both ways. On defense he plays all four positions on the defensive line. We move him all over and I think he likes that. He loves football. He's a football player. He plays 100 per cent of the time from scrimmage. He doesn't come off the field unless it’s a kickoff, a kick return or a punt." Ertl spoke about what he enjoys about playing both ways. "My favorite thing about the offensive line is you can engage people, you can drive them backwards," he said. "You can focus on just taking your man and put him on the ground. On defense, the (awesome) feeling of when you get a tackle for loss or a sack." Despite being one of the best - if not the best - player on the team, Austin is only a junior. While the captains are seniors, he has a role in being a team leader. "I feel like I'm one of the top leaders on the team," he said. "I feel like everyone on the team looks up to me," he said. "At practice I break the huddle, I'm the one that gives pre-game speeches. I just feel that now I'm a junior, people are looking up to me now and I'm helping the team get better as sort of a player-coach. When my game goes up, I feel other players games go up too." Good sees the change in Austin. "He's more vocal in practice. He's more vocal with his teammates," he said. "Whenever you're the best player on the team you are a leader by default sometimes and that can be hard for kids. He's taken that and he's learning, He's taken that upon him. Everything that's asked of him he's where he should be." After playing in the Woodland Conference his first two years at Tosa West, his team moves to the Greater Metro Conference, one of the area's toughest conference. Ertl is ready for that. "Better competition and I always like better competition," he noted. "It helps our team gel better. The off-season we had this year was the best off-season we've had since I've been here. I know going into the Greater Metro Conference the competition was going to be a lot better. It's going to help me get a college scholarship by coaches looking at my tape." Another advantage of being in the GMC is having cross-town rival, Tosa East, in the same league, instead of playing them in a non-conference game. "It will make the game a little more meaningful to us than just being the 'Tosa East rivalry.' It will help us get in the playoffs if we beat them." At the end of the interview, Good was asked what Austin was like away from football. "He's top notch. 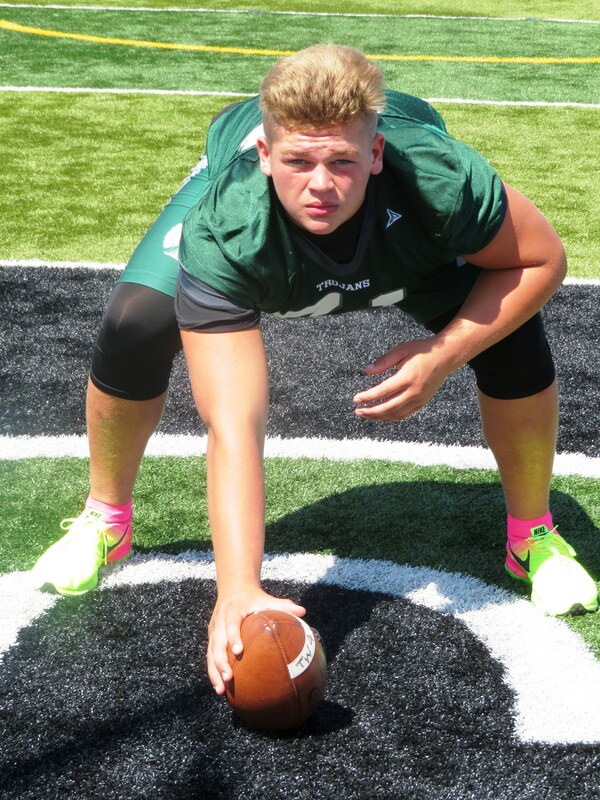 You have this kid who is 6-2, 290 pounds walking the hall," he said, smiling. "He still does some sophomore things, but overall he's a great kid." FAVORITE MOVIE: 'When the Game Stands Tall.' Thrillers. MOST MEMORABLE MOMENT: Rallying from 20-0 deficit to beat Pewaukee, 27-20, his freshman year. WHAT DO YOU WANT TO DO IN THE FUTURE: Attend a Division 1 school, play football and study Athletic Training.